Previously I mentioned I got a free Ryoko nendroid petit from KKnM. Not really my favourite out of the lot so I was delighted when bj0rN was willing to exchange with me his Harui (above). A win win situation for both. Thanks again bj0rN. 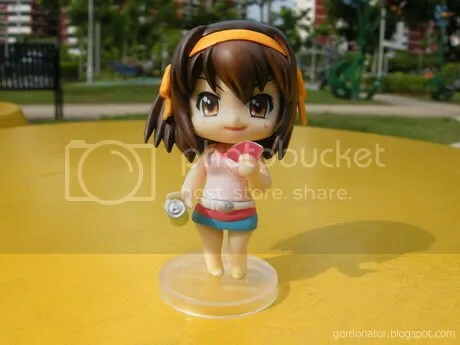 Since we are on the topic of nendroid petit, I never collected any of them prior to the free gift. Much preferred normal 1/8 scale PVC figures. But recently while I was reading through a forum, I chanced upon this picture of Konata nendroid petit which is like so cute~! I don’t mind getting the Konata in sukumizu but each nendroid petit is packed within a sealed box with no chance of knowing the content. So if you happen to have x-ray eyes, please drop me an e-mail. I pay will reasonably for your service. cute pics! what about buying already opened boxes? @bj0rn: MEIDO-GUY X-RAY EYES FTW. is the Meido-Guy X-ray eyes good? cos my Mangekyo Sharingan (万華鏡写輪眼)aren’t up to standard yet. use up too much of my energy so won’t be using it at the shop. too risky. After reading this entry, I’m thinking of buying petite figures too..
Usually how much does one cost? 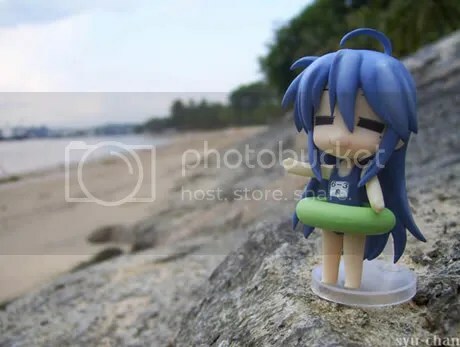 this is so weird but yesterday the podcast that i listen to had a segment talking about the Lucky Star nendoroid puchi figures and the one that everyone wants is the konata swimsuit figure. i want that one!!! the other time i tried my luck at rapid culture, i got the pointing haruhi! =D so lucky. that was my one n only box of nendriod petit. hehehe. but when i tried to superglue the ribbon in front of her chest which keeps falling dwn, i accidentally kena the back of the head and one small blob of colour came off. damn sad. not sure about the price. never bought one before. around or less than $10 maybe? konata swimsuit is the cutest of the lot. GET! the otaku/anime/figure shops in your area don’t have it? I’ve just received my Nendoroid Petit Lucky Star yesterday from Hobby Search. Being checking out the ‘Restock Figurines’ consecutively for about 1 month. Well sad to say, it was once again SOLD OUT half an hour after I placed my order. The total cost comes to around Sgd$90 plus shipping.